For Wales, 15th time is the charm. After missing out on the first 14 European Championships, the Welsh qualified for their first this summer. Led by star man Gareth Bale, the Welsh not only qualified but stand a good chance of getting out of their group. Wales qualified automatically out of group B, finishing second behind Belgium. Not only did they qualify, they did it with a game to spare and ended up finishing on 21 points, four ahead of third place Bosnia and Herzegovina. Chris Coleman’s side qualified in style, going unbeaten in their first eight qualifying games. You would think that this bookmaker or that bookmaker would have to take the Welsh as serious opposition after such good form. The crown jewels on their qualifying campaign were their two matches against Belgium. In those two matches, they got four points, did not concede a single goal, and conceded only seven shots on target over the two games. The crown jewels on their qualifying campaign were their two matches against Belgium. In those two matches, they got four points, did not concede a single goal, and conceded only seven shots on target over the two games. It was really hard to predict such results. Everyone knows the main man for Wales is Gareth Bale. The most expensive player in the world scored seven of Wales’ 11 goals in qualifying, is their leading active goalscorer, and has scored the fifth most goals in the history of the Welsh national team. He was just as good for his club team as he was for Wales, scoring 0.99 non penalty goals per 90 minutes this season, better than his last season in England when he scored 0.65 non penalty goals per 90 minutes, according to Squawka.com. Their other main player is Arsenal midfielder Aaron Ramsey. Manager Chris Coleman says “He (Ramsey) can open doors no one else can.” He is also one of their main goal threats outside of Bale, he scored two of the teams four non-Bale goals in qualifying. They also have Joe Allen who was impressive towards the end of the season for Liverpool. Swansea and Wales captain Ashley Williams will lead the Welsh defense that conceded only four goals in qualifying. The centre-back led his club team through a bumpy season and will now look to lead Wales though their first ever European Championship. Williams will definitely play in the center of defense, but the number of defenders with him is a question. After playing a more traditional 4-2-3-1 in the past, Chris Coleman toyed with a five man defense in qualifying and used it in their last two friendlies leading up to the tournament. Sam Vokes of newly promoted Burnley will also have a big role to play. As mentioned, the Welsh aren’t flush with goalscorers. Vokes is the only player outside of Ramsey and Bale with more than five career international goals. He’ll likely be tasked with leading the line and trying to grab a few goals to help lift Wales into the top two. Wales will start their tournament on June 11th against Slovakia in Bordeaux. They’ll then make the 800+ kilometer journey to Lens in the north of France to take on England for their second match on June 16th. Then they’ll finish the group stage by traveling another 800+ kilometres back to the south of France to take on Russia in Toulouse on the 20th. Winning the group would land the Welsh in Paris to take on a third place team on June 25th. Finishing second would land them in Nice against the runner up in group F, likely one of Portugal, Austria, or Iceland. A third place finish would leave them in the balance, but if it was enough to go through they’d play either the group C winner, likely Germany, or the group D winner, likely Spain. The Welsh have hit a bit of bad form with just one win in their last seven matches. That said, their group is very winnable with Wales probably coming in as second favourites behind England. It’s their first ever European Championship, but, with players like Gareth Bale and Aaron Ramsey, they have every chance to make some noise in France. I cant forget that time. That was a memorable day. Just very exciting! Categories: Arsenal (NN), EPL Index Featured Article, EPL Team Analysis, Euro 2016, Liverpool (NN), Swansea City (NN), and Tottenham Hotspur (NN).' 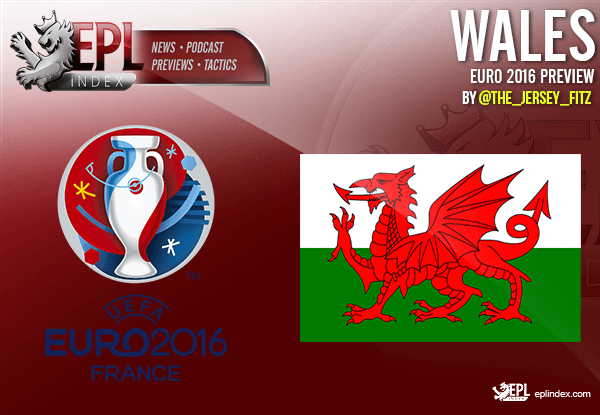 'Tags: ASHLEY WILLIAMS, Bale, Coleman, ramsey, vokes, and Wales.